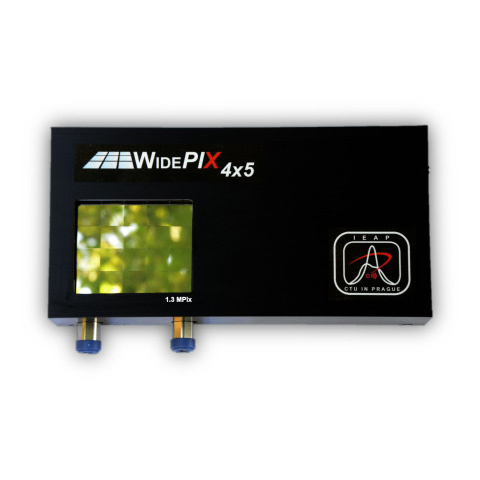 The large area imaging detector WIDEPIX®4×5 with resolution of 1280×1024 pixels (1.3 Mpixels) and continuously sensitive area is composed of a matrix of sensitive detector tiles. Each tile consists of single Timepix hybrid detector (256 x 256 pixels) with edgeless silicon sensor. The whole area of the WIDEPIX® device is fully sensitive without gaps. Each pixel has integrated digital counter which counts number of particles (e.g. X-ray photons). This particle counting principle assures noiseless detection and no added noise (integration and readout noise is zero). The noiseless detection allows getting images with very high contrast and broad dynamic range (theoretically unlimited). Therefore even low mass objects (e.g. plastic or soft tissue) are imaged with high contrast. The Timepix technology allows setting of energy threshold. This feature allows obtaining of multichannel "color" radiographs where different materials are identified and imaged in different colors (similar to color photography). This feature requires getting of several (at least two) subsequent snapshot with different settings of energy threshold. The intrinsic spatial resolution of the camera is defined by pixel size which is 55 µm. The pixels situated on the border of tiles are 2.5 times larger in one direction. The corner pixels of tiles are 2.5 times larger in both directions. The camera is connected to the controlling computer via single USB 2.0 cable with readout time of 0.6 seconds per frame. The thermal stabilization of the camera is in dependence on environment provided either by ventilator, a passive water cooling system or an active water cooling system with chiller (recommended). The power consumption is 25 W.
The system was developed by IEAP-CTU in Prague, Czech Republic. Leave your contact information and we'll get back to you!